Robin Danner is native Hawaiian from the island of Kauai. 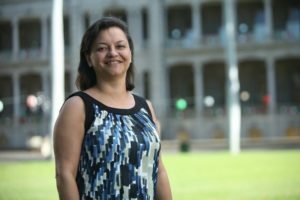 She is the founding President and CEO of the Council for Native Hawaiian Advancement (CNHA), a non-profit dedicated to supporting Native Hawaiian communities and the organizations that serve them. Robin was raised on the Navajo, Hopi and Apache reservations of Arizona and lived 25 years among the Inupiat Eskimo of Alaska. Danner has extensive management experience in the not-for-profit, business and government sectors, including 13 years as Vice President of the National Bank of Alaska; three years as Executive Director of an Indian Housing Authority that served 8 federally recognized tribal governments; and three years as the Director of Housing for one of the largest municipal governments in Alaska. She is the Vice Chairman of the State Council of Hawaiian Homestead Associations, a Director on the Board of the Inter-Tribal Economic Alliance, a member of the Waianae Hawaiian Civic Club, serves on the Hawaii Advisory Committee of the Human Rights Commission, and oversees the operation of the Native Hawaiian Economic Alliance. She has received the Alaska Governor’s Volunteer of the Year Award and the Small Business Minority Business Advocate of the Year from the state of Hawaii. Her expertise is in public and private administration, business and community development with a specialized focus on rural and Native American populations.